When it comes to slinging spanners most young blokes are keen to pull stuff apart, but quickly realise its tough putting it back together. Young Brad James is different. Not only can he put it back to together, he makes it work — as you can see from his FX ute. 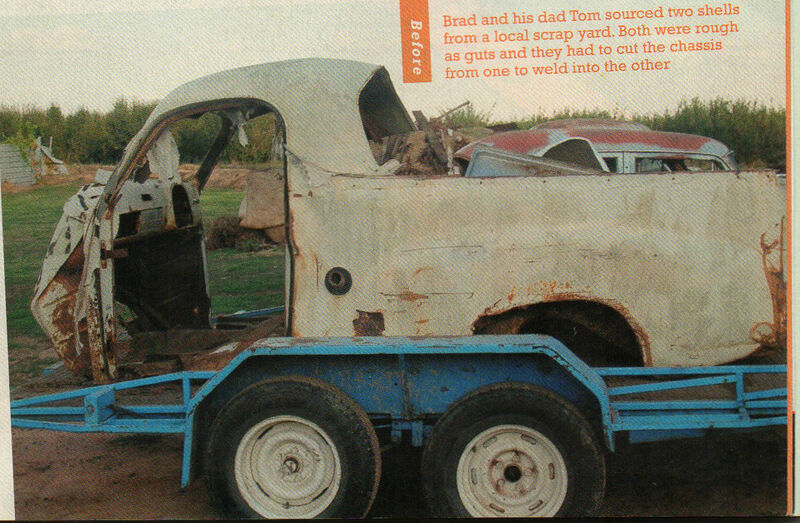 It all started for Brad tinkering in the shed with a bunch of grey motors his dad Tom had. Tom was a founder of the Howling Humpy's — a classic speedway class that uses grey-power FX and FJs — so he had a few spare donks. "I always liked the old grey motors': Brad explains. "Dad usually had a few dungers lying around so I mixed a few parts around to get something going." 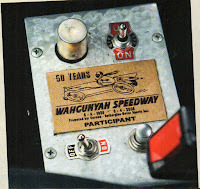 This was when Brad was in his early teens and with a motor ready they decided to slot together a speedway car. Tom got a couple FX shells from a mate who ran a local scrap yard. Both were pretty sad. One had been lifted with a hook through the back window, distorting the roof, while the other had a better body, but rusty chassis. "They were pieces of poo when we got them," Brad admits. So they decided to combine the two. Easier said than done of course, and since it was to be a racecar they decided the channel the body four inches. A pair of sills was cut from a Chrysler Centura and welded in to replace the rusty originals. They opened up the rear wheel aches for larger rear tyres, removed the spare wheel door under the back and closed up the tailgate opening using metal from a Torana bootlid. With no plans to drive the ute on the road they set the engine back 14in and built a new removable firewall out of aluminium checker plate. A full rollcage with fixed intrusion bars was welded in and doors made up from a pair of skins on simple frames. The idea was to keep things cheap and simple. They already had an engine but pulled it down to check it. It was rebuilt using mostly used parts — even the bearings were second hand. "There's only two new parts in the motor — the file-fit rings and the reground cam': Brad laughs. All else they pulled out of other motors. But Brad says there's a new 150ci 'big-bore' donk on the way with a ported head and roller rockers. The gearbox is an all-synchro three-speed with a heavy-duty red motor clutch. Diff is a standard FJ with a HR centre and 3.08 gears. It runs factory drums behind customised FX rims with 14x7s front and 14x8s rear — and go-domes for a bit of bling. Brad credits his dad for the colour scheme. They initially looked at Jetstar orange and black, but decided it needed a little white. 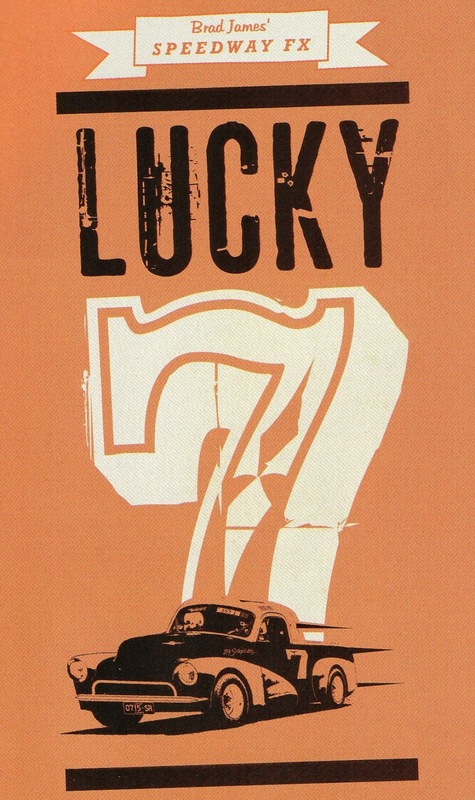 Race numbers and signage are by Robbie Farren; Brad says seven is his favourite number. Now they had a racecar, but where to race? 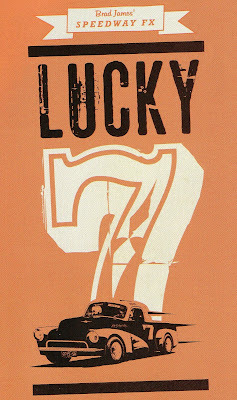 decided to register it on street rod rego. A few changes need to be made. Glass and headlights just for starters. Plus some new seats to replace the fibreglass race seat and cutting out the intrusion bars. It also needed proper doors. They got busy. 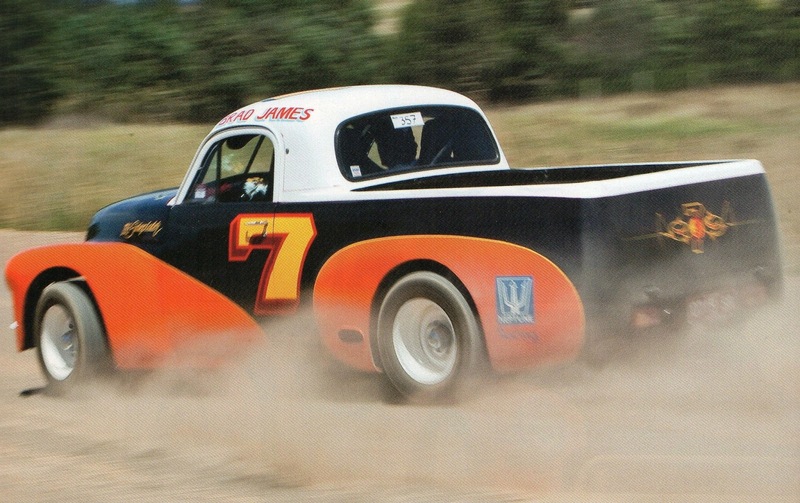 The aim was to take it to the Kustom Nats at Phillip Island in a month. It was an epic thrash at the end with a 36-hour stint before pushing it onto the trailer. 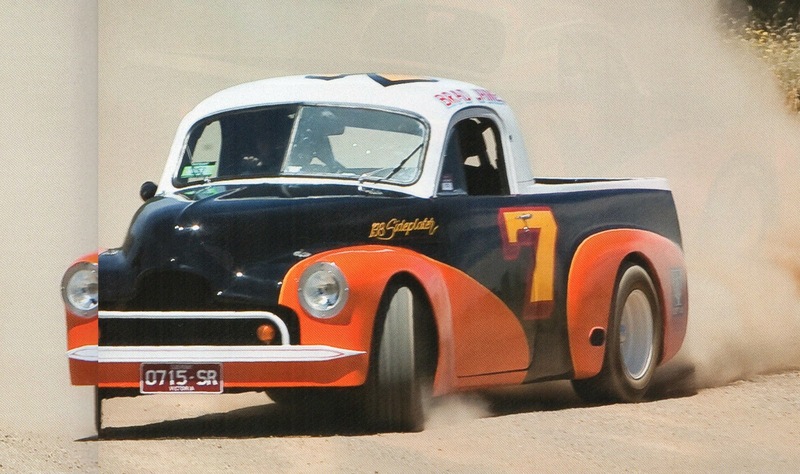 Carby issues meant the ute wasn't running, but they got their street rod plates and got it going at the event. That was four or five years ago. Brad is 19 now and has his licence. He's driven the ute to events like Chopped and Summernats 25 and drives it regularly around his hometown of Shepparton. "I used to drive it to school. It was the first car I drove when I got my P plates',' he reckons. "It's friggin' loud at 110km/h because everything is solid mounted and the motor's right there beside you [laughs]. But it's a bit of fun and hangs on like it's on rails.